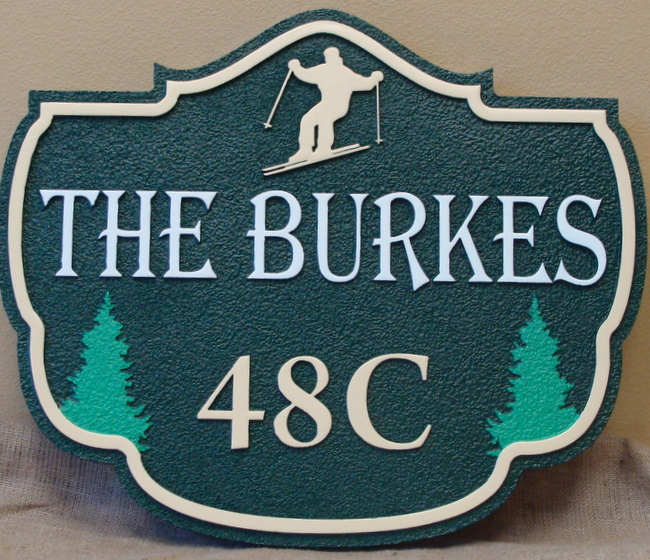 The attractive sandblasted 2.5-D HDU ski cabin name and address sign shown above has as its focal point the artwork, a skier and trees. The text, art and border are raised at 3 levels in 2.5-D (flat) relief.This sign has its text, border and artwork carved in High-Density-Urethane (HDU). The green background surface is sandblasted in a sandstone texture. After painting, the sign is clear-coated twice. This sign can be mounted on a wall, a door, a gate, on a post, or hung from a wrought iron or wood hanger or an eave beam on a cabin. It will last for decades in snow, ice and rain. This is a very popular sign design.